Life didn’t promise fair-play or a zero-problem lifetime! How good you are has nothing to do with what you have go through in your lifetime. This is one paradox that flummoxes all of us: If being good, doing good is the essence of humanity, then why do I have to go through pain and suffering despite being good and doing good myself? Look around you and you may get enough evidence of this perspective to be true. Good people are going through troubled times __ joblessness, cashlessness, poor health, broken relationships. And the corrupt, the unethical, the violent folks seem to be having a good Life. Is there any fair-play at all in Life, you may wonder? Let’s address your concerns. First, know that Life did not promise any fair-play. It did not guarantee you anything when you were born. It didn’t say if you are good, ethical, sincere and hardworking, it assures you a problem-free lifetime. So, the expectation that you should have no problems is irrational, impractical, unfounded and unrealistic. Second, the nature of Life is that it is pre-ordained. You believe it or not. But everything that you have gone through, are going through and will eventually gone through, is cast. All you can do is to play the game of Life, every single living moment of yours, even as the joystick is in Life’s hand and so is the rule book. Life’s essence is to deal with WHATEVER comes at you! Therefore, third, don’t wallow in shallow unjustified perceptions that the unethical and corrupt, who in your eyes do all wrong, are living it up! By imagining so, you cause yourself more grief. Fourth, if you have been created, as you have been, and you are alive, as you are, then be sure, your Life will have its share of problems. Life’s meaning is not zero-pain. Life is really about developing the ability to deal with pain, while learning to avoid the suffering that comes with it. Intelligent living, therefore, is all about being happy despite your circumstances. Today is the celebrated Tamizh poet Subramaniya Bharathi’s 130th birth anniversary. 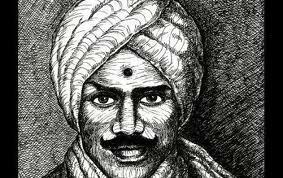 History and the present generation will both concur that India may well not see another poet ever of Bharathi’s stature, brilliance and patriotic fervor. Yet, apart from dying young at 38, Bharathi also died with so much pain. It was so irrational. First, he was imprisoned several times by the then British rulers of India. Then he was felled by an elephant at the Parthasarathi Temple, Chennai, which, ironically, he used to feed regularly. He never really recovered from these setbacks. His prolonged bouts of ailments finally took his Life on September 11, 1921. It is both a recorded and ignominious fact that ONLY 14 people attended his funeral. Imagine, India’s most revered son and celebrated poet today, did not have more than 14 people to see him off on his last journey! How unfair and cruel is that? So, stop expecting Life to be fair and mourning the fact that it never is. To be sure, it never promised it would be fair. So, accept it for what it is. The key is to understand this truism. And continue being good and doing good, not expecting anything in return, and to know that your goodness is good for your inner peace, and to know also that what’s embedded in your Life’s design, you HAVE to face and overcome. If you learn from that experience and, importantly, learn to be happy despite what you have to experience, well, then you will have lived your Life meaningfully! Author AVIS ViswanathanPosted on December 11, 2012 March 14, 2016 Categories Fair Play, Goodness, http://schemas.google.com/blogger/2008/kind#post, Intelligent Living, It is what it is, Problems, Subramaniya BharathiLeave a comment on Life didn’t promise fair-play or a zero-problem lifetime!